When William Bliss, the son of self-made magnate Duane Leroy Bliss, stood on the East Shore of Lake Tahoe outside the fledgling town of Glenbrook, Nevada, on August 29, 1940, it’s unlikely he realized that the debacle of a project he was about to embark upon would come to embody his career. The oldest of D.L. Bliss’ five children, William Bliss was an architect by training, but hopeful of inheriting his father’s Carson Tahoe Lumber and Flume Company and continuing to build upon its success into the twentieth century. D.L. Bliss was one of the most successful businessmen in Lake Tahoe history. Born in Massachusetts in 1833, he tried his fortune with the 49ers at the tender age of 16. After vying with other hardy pioneers coursing over the Sierra’s spine, Bliss came into his own in 1860, managing a Silver City quartz mill. From there, he ascended through the ranks of the burgeoning industry until he hit upon a business idea that would render him flush—supplying lumber to Virginia City mining companies mad to dig out all the silver sleeping in veins of rock beneath Nevada’s desert. 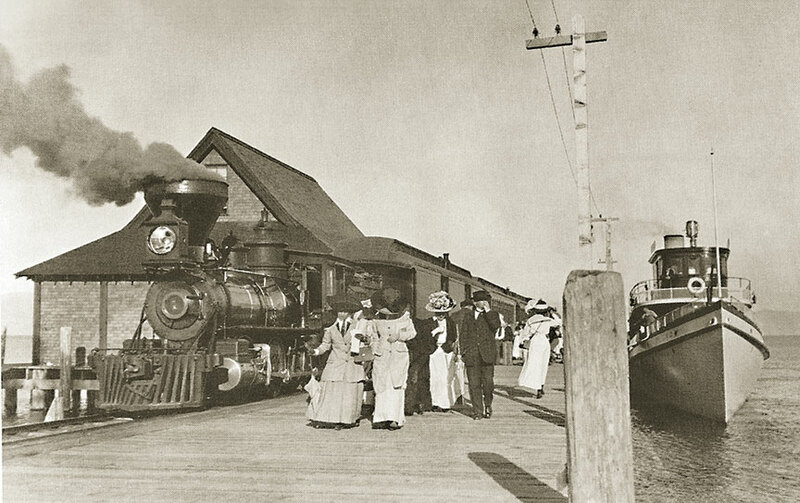 He formed the Carson Tahoe Lumber and Flume Company, commissioned the construction of the famous flume that conveyed timber from Lake Tahoe’s East Shore to the mines outside Carson City, built a narrow gauge railroad from Glenbrook to Spooner Summit and began buying up real estate all around The Lake. At one point, D.L. Bliss, for whom a large West Shore state park is named, owned 50,000 acres in all five counties surrounding Lake Tahoe. Perhaps the embodiment of D.L. Bliss’ ascendancy to the upper echelons of Western wealth was the 169-foot-long steamship SS Tahoe, replete with every luxurious amenity available. As the Comstock Lode’s silver dried up, demand for Tahoe timber waned accordingly, and D.L. Bliss, ever the man of vision, saw that Lake Tahoe would transition into a playground for San Francisco, Reno and Carson City’s wealthy. Thus, he built hotels and sought to dominate the transportation infrastructure of the remote mountain getaway. D.L. Bliss commissioned San Francisco’s Union Iron Works to construct the SS Tahoe in 1894. The parts were forged and shipped piecemeal via train to Carson City, where a horse-drawn wagon drug them up for assembly on Glenbrook’s shore. The steamship launched in June 1896. It disembarked from Tahoe City, carrying up to 200 passengers, cargo and the daily mail while rotating in a counterclockwise direction to deliver its freight. Two wood-burning boilers turning a 2,400-horsepower turbine that drove two enormous three-bladed props powered the ship. Bedecked with brass and marble fixtures, electricity, steam heat, hot showers and an ample dining room, the vessel was the picture of luxury and style and a symbol of D.L. Bliss’ material success. 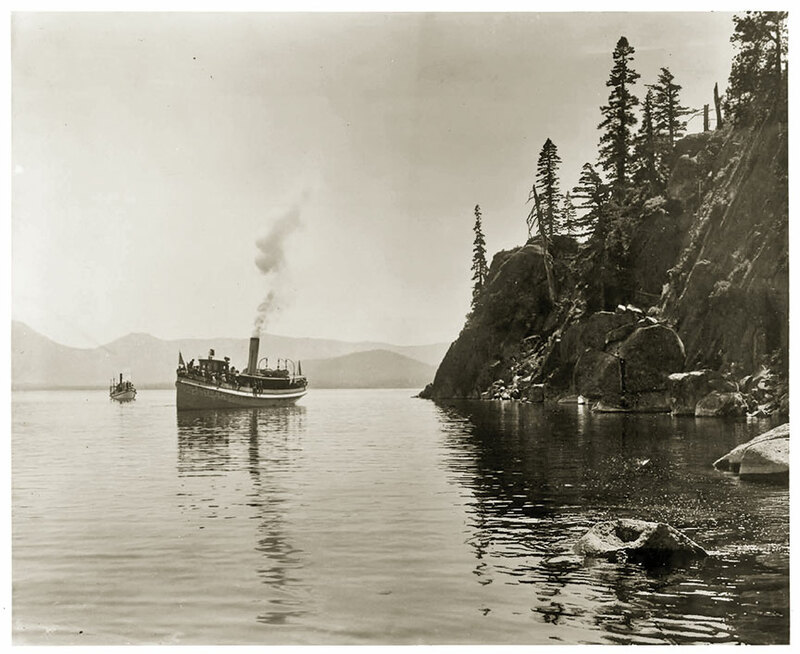 However, the advent of new technologies, including the automobile, soon rendered the ship’s reign as queen of Tahoe’s waters obsolete. 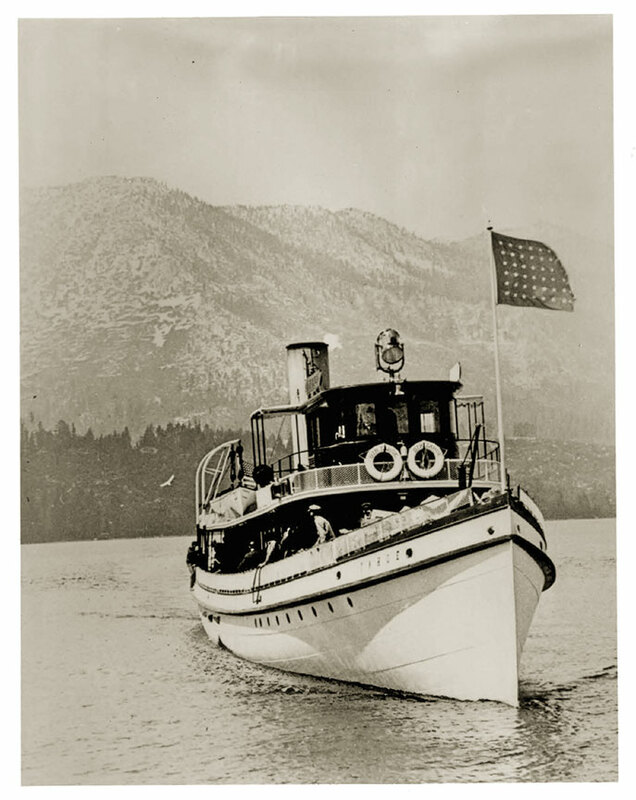 In 1930, after nearly three decades of supremacy, the SS Tahoe received the greatest blow to its relevancy as the highway around Lake Tahoe was completed, meaning cargo, people and mail could be transported more efficiently. The SS Tahoe lost the U.S. Mail contract in 1934, and William Bliss, struggling to prolong his father’s business glory, sold the ship, which sat defunct just off Tahoe City’s shores. Vandals defaced and even used the once-proud boat occasionally as a rough commode. Embarrassed by the degradation of his family heirloom, William Bliss bought back the boat for a song and began his most ill-fated project. He decided he would scuttle the grand ship in 100 feet of water, just off Glenbrook, where the boat was born, and glass-bottom boats would be able to observe the grandeur of yesteryear. The SS Tahoe would serve as a sort of underwater museum, the thought went. On August 29, 1940, William Bliss stood with a throng of bystanders gathered to watch the family’s beloved vessel sink to The Lake’s floor. The only problem—a major one—was the engineers in charge of the project, including William Bliss, miscalculated the slope of The Lake floor off Glenbrook’s shore, and the boat sunk and then slid out of sight, taking with it any plans for an underwater museum. So concludes the first part of the drama. As much as the first installment is about the decline of a family’s fortunes and the vanishing of a gilded age at Lake Tahoe, the second installment is about dreaming wildly, about tempting the impossible, about feats of human engineering as opposed to debacles and, in the end, about peerless accomplishment. Martin McClellan grew up in nearby Reno, but didn’t become fascinated with Tahoe’s depths until later in life. McClellan admits he knew nothing of the SS Tahoe or three other boats scuttled or purposefully sunk in the early twentieth century. Instead, he discovered the mystery of the SS Tahoe and its maritime graveyard by way of a devotion to SCUBA diving’s technical aspects. In 1998, McClellan was studying decompression theory, mixed gasses and technical equipment in relation to deep diving. While he stored that realization away, he and colleague Brian Morris began developing advanced computer software simulating the decompression theory that allows SCUBA divers to delve deeper underwater and stay there longer than ever before. They soon realized that going deeper for its own sake wasn’t as attractive as going deep for the sake of discovery, of seeing something never before seen. In 1999, the pair set upon the SS Tahoe as the goal that would not only allow them to test diving’s technical aspects, but would also draw attention and funding to their effort. McClellan established the nonprofit New Millennium Dive Expeditions and began raising funds sufficient to back a complex and equipment-needy project. Along with money, the growing team of divers needed to iron out one fairly important detail: the precise location of the SS Tahoe. Lockheed Martin Perry Technologies, a California-based company interested in developing Remote Operated Vehicles, contacted McClellan. The company’s research and development team needed some experience in freshwater operations so they assisted McClellan and his team in locating and placing a permanent GPS marker on the location. After three years of preparation—which included tackling the complexities of SCUBA diving in a high-altitude lake—and assembling a competent team prepared to carry out various functions associated with such unprecedented dive conditions, McClellan and Morris steeled themselves for the initial foray down into the wreckage. On June 29, 2002, nearly 62 years after the SS Tahoe was scuttled, the two men descended into Glenwood Bay with an admixture of excitement and a great deal of nervousness about whether the dive was possible or safe. At around 10 a.m., McClellan and Morris dove into the Big Blue, slowly descending through The Lake’s layers until the sunken vessel came into view. The ship is “in great shape,” McClellan says. Still intact, with its aft air funnels warped from the impact with the floor upon sinking and the subsequent slide down the Glenbrook shelf, and the roof, cabin and pilothouse gone, the boat still retains many features apparent from historic photos. The boilerstack is standing and the boat tilts only slightly to its port side. Treasure hunters who found the wreckage in the 1960s and used a grappling hook and a pulley system to salvage collectible pieces of the ship caused minor damage. The dive would be the first of many trips to the bottom of Glenbrook Bay (a total of four in 2002). 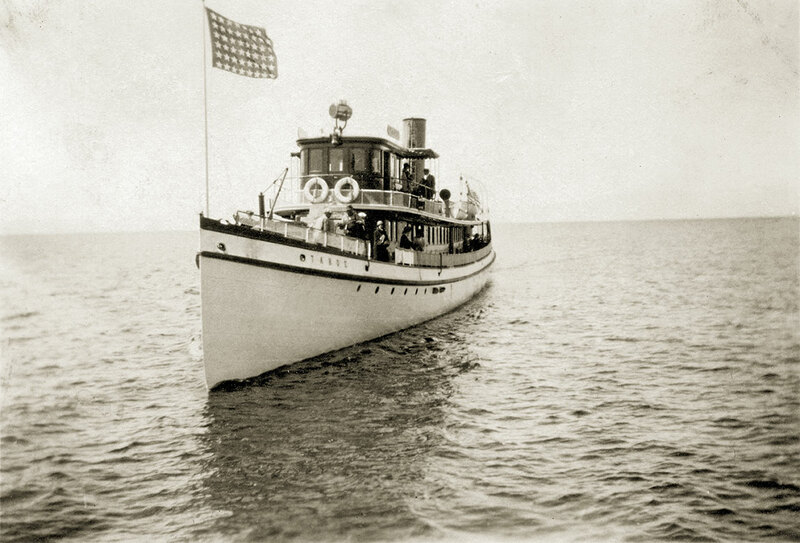 McClellan would not only set a record for the depth of a high-altitude dive, but would draw the interest of the Nevada State Preservation Office, which would go on to name the SS Tahoe as the first maritime site in the Silver State to be listed in the National Register of Historic Places. With funding from the Nevada Division of State Lands, New Millennium Dive Expeditions executed dives from 2009 through 2011 for the purpose of gaining additional footage and providing detail for a map that charts the wreckage site. While New Millennium Dive Expeditions has plenty of laurels to rest on after accomplishing the astounding feat of exploring the sunken SS Tahoe, McClellan and some of his partners continue to use SCUBA diving as a means of broadening knowledge about what lurks beneath the surface of Lake Tahoe. The nonprofit entered a partnership with University of Nevada, Reno limnologists to provide scientists that study The Lake with personal observations of underwater conditions from the surface down to about 450 feet. However, McClellan will always be closely tied to the first dive down to the SS Tahoe, thereby performing a feat of historical alchemy, transforming the fallen and lost glory of a bygone era into a surer, more durable glory by replacing the allure of affluence with the enticements of adventure. Matthew Renda is a Santa Cruz–based writer.